As a business owner, you know the importance of advertising and taking care of the customer. Each of these facets are vital to your bottom line--the profitability and viability of your company. Did you ever stop to consider the impact that a clean sales and production environment has on potential customers and, perhaps of greater importance, your own employees? First impressions matter. Your building reflects the quality and professionalism of your company. A clean customer sales area validates your attention to the little things that add to customer confidence in all their dealings with you. It makes them feel welcome and enhances their perception of you and your company. A clean work environment contributes to improved employee health, reducing employee sick days. A clean work environment creates a welcoming, safe atmosphere, often bringing with it a positive influence on employees and customers alike. We welcome the opportunity to meet with you to discuss your building maintenance and janitorial needs. 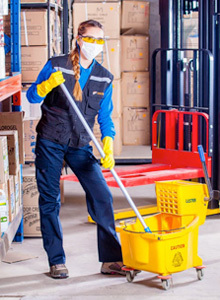 We serve manufacturing, corporate and distribution operations clients and we're a leader in providing green janitorial services that specialize in the responsible use of cleaning techniques and materials that we obtain from local sources. Our management is certified by the Green Business League and the Cleaning Management Institute and you'll find our staff to be well trained in all aspects of their duties. They'll provide you with a sparkling production environment while working within all EPA guidelines and complying with OSHA standards. We can tailor our services to meet your specific requirements on a schedule that best fits your operational needs.